My little boy is still taking up most of my time but things have started to settle into a more manageable routine in the last few weeks giving me time to get back to my usual crafty ways. My first proper piece of crafting since having the babe has been this little Santa hat that turned out just how I had pictured it and was surprisingly simple to make. I've even gotten round to writing up the pattern for this and you can find it on the CrochetMe website at: http://crochetme.com/patterns/baby-santa-hat. Doesn't he look like the cutest little guy you've ever seen? Hopefully this hat will still fit him for Christmas day, but if not I can always make him a new one! 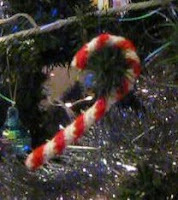 My second bit of crafting is a couple of little crochet candy canes from a PlanetJune free pattern (http://www.planetjune.com/blog/free-crochet-patterns/candy-cane/). These little candy canes are lovely as tree decorations and so quick and easy to make, perfect for the mum in a hurry! Now I'm off to try and finish off an adjustment to one of my early patterns which hopefully I'll be able to show you the results of soon.